Graham, M. and M. Zook. 2011. 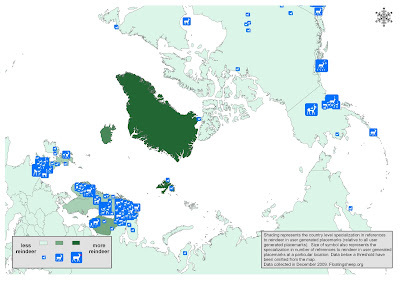 Visualizing Global Cyberscapes: Mapping User Generated Placemarks. Journal of Urban Technology. 18(1). 115-132. 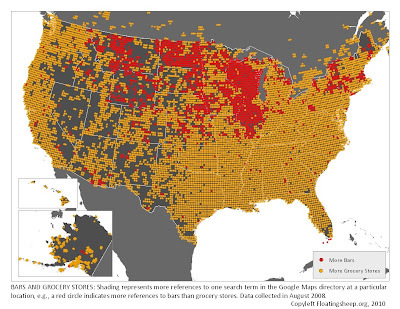 Our work on mapping virtual references to bars and grocery stores (aka the beer belly of America map) has just been featured in the New York Times. Click over to Floatingsheep.org for the full post. Following up on an earlier floatingsheep post on the online geographies of religion, we’ve just uploaded a new set of maps that visualise religious cyberscapes. Below is the global-scale map, and the rest are available at floatingsheep.org. 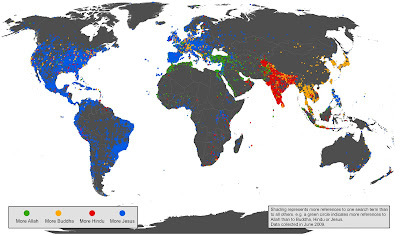 Examining the geographies of Google placemarks can lead to a variety of useful insights about the world. So, as Christmas draws ever closer, myself and colleagues at the floatingsheep blog wondered whether an analysis of placemarks could help us answer the age old question about “where does Santa Claus live?” To answer this question, we decided to map out the cybergeographies of Christmas in order to ultimately create a “MegaChristmas Index.” More details and maps are available at the full post at floatingsheep.org. 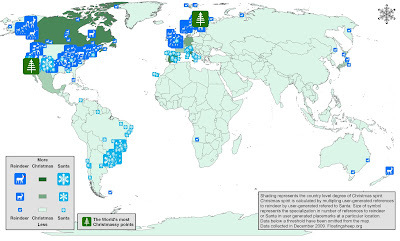 But in the meantime, here are a few of our findings - including one map displaying the world’s most Christmassy places.